RIT environmental science students evaluate the impact of the Rochester Museum and Science Centerâ€™s green infrastructure. Their analysis of water samples following periods of rain helps the museum monitor the performance of the permeable pavement and bio-retention areas. A local focus on the environment will fill a tent at Imagine RIT. The Environmental Science in your own Backyard exhibit will feature issues facing the next generation of environmental professionals and innovative techniques, like green infrastructure, for mitigating environmental impacts. The exhibit will highlight several student research projects, including ongoing contributions to the Rochester Museum and Science Center’s award-winning Regional Green Infrastructure Showcase. Students working on the senior capstone project will share their progress in monitoring the performance and impact of the museum’s green roof, permeable pavement and bio-retention rain gardens and related educational installations. Successive teams of environmental science seniors from the College of Science have developed and installed equipment to measure the outflow from the green-roof drain, soil properties and pollutant levels in the rain water. Interactive indoor exhibits educate visitors about the benefits of green-infrastructure practices. The senior capstone project was supervised this year by Kaitlin Stack Whitney, visiting assistant professor in environmental science in the College of Science and in the science, technology and society department in the College of Liberal Arts. The collaboration grew to include students from the Kate Gleason College of Engineering and the College of Imaging Arts and Sciences. Graduate students from the sustainable engineering program developed new concepts for the museum’s café. Senior graphic design majors from Advanced Interactive Media, taught by Melissa Warp, visiting assistant professor in the School of Design, focused on creating new signage for the green pavilions and animations that explain how the green roof and rain barrel system work together. 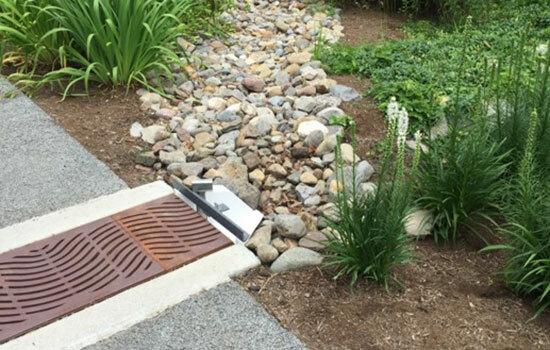 The Regional Green Infrastructure Showcase is overseen by the Water Education Collaborative, a not-for-profit organization that operates under the auspices of the Rochester Museum and Science Center. Christy Tyler, associate professor in the RIT environmental science program, is a member of the collaborative and the senior capstone adviser. The project won the 2017 Honor Award of Excellence in the Research and Communication from the American Society of Landscape Architects New York Chapter. Other projects in the “Environmental Science in Your own Backyard” exhibit will focus on issues facing local watershed systems, wetlands and nature areas, and the effects of climate change on apple production. Maps and posters will show results of studies from “backyard” research sites on campus and from around western New York.